The project is supported by a Viva Foundation Fellowship, which enables me to spend a month (May 2015) working on the archives held at the Autry National Center of the American West, located in Griffiths Park, Los Angeles. Using primary sources such as advertising brochures, garments, trade catalogues and photographs, the project focuses on the female dude rancher during the Interwar era and the clothes, accessories, travel accoutrements and style flourishes that comprised her vacation wardrobe. On occasion, dress history projects may be ‘accused’ of dealing with the spectacular, the exclusive and/or the unique. And, in the case of riding dress history, scholarly studies have considered (almost without exception) the highly regulated uniforms of formal attire. The casual dress worn for, say, informal hacks and trekking has been overlooked and lost in the historical record: mundane, ordinary and insignificant. The Buckskin and Ballgowns project responds to this scholarly oversight, taking the dude ranch vacation of the 1920s and 1930s as a site (on the face of it) of informal dress, where the strict codes of East Coast riding did not apply – or, at least, were disrupted and reinvented. There is a very substantial and well-regarded body of literature on the history of the American West and, within that, commentaries on the dude ranch are plentiful and analyse, to a certain extent, the significance of dress (see for example Borne 1983; Johnson 2012; Rodnitzky 1968). Academic studies that focus centrally on the material culture – and dress – of the West are, however, more modest in number and tend to take the form of expansive historical overviews (Beard 1993; George-Warren 2006; Greenlaw 1993) or object based analyses of particular garments or people (Wilson 1996 and 2001). The wardrobe of the female dude ranch tourist (during the Interwar period) has yet to have been mapped fully and/or posited as the primary concern of any given study. Buckskin and Ballgowns attempts to redress this. Moreover, in dealing with the female dude rancher, there is an opportunity to extend the breadth of her wardrobe in, and for, the historical record. Existing studies have concentrated exclusively on the study of dress worn to participate in horseback (or equestrian-related) activities on the ranch (such as round-ups, branding, mustering and trail-riding). However, the Buckskin and Ballgowns project asserts the novel premise that dude ranch vacations presented a broad diet of leisure pursuits that require a finer granulated appreciation of relevant clothing and related body techniques than the scope of previous studies has allowed. Swimming, fishing, cook-outs, and even flower gathering, polo matches, guitar playing and dancing formed an eclectic programme of diversions and, with them, various possibilities of dress. Amory, the regular fashion advisory columnist for The Sportsman, a 1930s equestrian periodical, is a rich source of insight on this matter. In her April 1933 (p. 43-48) article on dude-ranch etiquette she counselled her female audience: “…you won’t ride every day. Take your golf clubs. There are many excellent links not too far away as distances are judged in the West. Bonwit Teller will knit in chenille to your measure and color a two-piecer with saddle shoulders and ribbed to a hug-me-tight.” The same article also detailed suggested clothing for quiet moments of relaxation (pyjamas and a bathrobe); evening receptions (a high-necked crepe dress with a floral print), and discouraged the daring trend for shorts in daytime. Bathing suits, it was advised, may be worn underneath riding clothes to allow for an impromptu dip in a creek or watering hole. And a modern, easy care, non-slip, girdle (rather than a corset) was suggested as the smart choice for underwear when in the saddle. 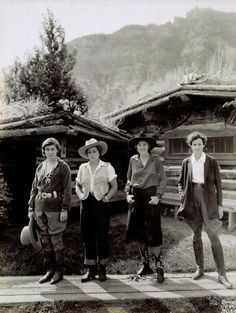 In sum, the popularity of vacationing at dude ranches ‘Out West’ during the 1920s and 1930s brought forth a combination of unusual sartorial challenges for female tourists. These challenges present a rich opportunity for original research on the material culture of the West: one that the Buckskin and Ballgowns project seeks to fulfil. References Cited: Amory, (1933) ‘The Sportswoman Observes’ The Sportsman April, pp. 44-48; Beard, T. (1993) 100 Years of Western Wear Layton, Utah: Gibbs Smith; Borne, L. (1983) Dude Ranching: A Complete History University of New Mexico Press; George-Warren, H. (2001) How the West Was Worn Harry Abrams Inc; Greenlaw, M. (1993) Ranch Dressing: The Story of Westernwear Lodestar Books; Johnson, A. (2012) ‘Romancing the Dude Ranch 1926-1947’ The Western Historical Quarterly 43, 4 Winter: 437-461; Mathews, M. ed. (1951) A Dictionary of Americanisms Uni Chicago Press; Rodnitzky, J. (1968) ‘Recapturing the West: The Dude Ranch in American Life’ Arizona and the West 10: 2 Summer: 111-126; Wilson, L. (1996) ‘The Cowboy: Real and Imagined’ Dress, 23: 3-15; Wilson, L. (2001) ‘American Cowboy Dress: Function to Fashion’ Dress, 28: 40-52.